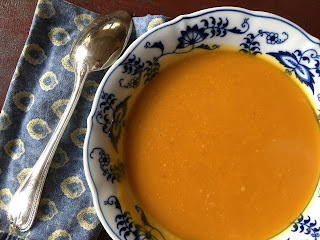 I couldn’t believe how good this soup was given how simple it was to make with so few ingredients, perfect for a New Year's dinner or après-ski. In a large soup pot begin by sautéing a large chopped onion over medium heat in a little bit of butter. While that’s cooking peel and seed approximately 2 ½ pounds of butternut squash and chop into small chunks. Once the onion is translucent add the squash to the pot along with 5 to 7 cups of chicken stock, depending on how thick you like your soup. Bring to a boil then simmer for 30 minutes uncovered or until the squash is tender. Use a stick blender or food processor to puree the soup until its silky smooth then stir in a cup of grated parmesan cheese and salt and pepper to taste. If you like herbs you could sauté a little bit of sage with the onions just before adding the squash. Have a safe and festive 2017!